The Plasmodium one beast of a radio control vehicle with machinery arms and head armour. It transforms from a cyberball to a cyberbeast in seconds! Mud, grass, pavement can NOT stop the Plasmodium. The incredibly adaptability will fascinate kids! 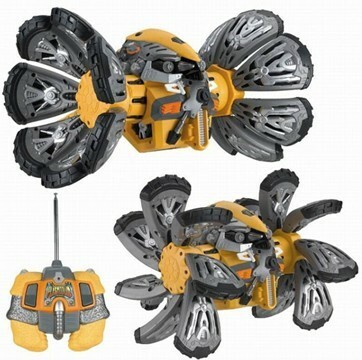 The Plasmodium vehicle's special creature features and bio-mechanical design is unlike any other radio control vehicle. With a back wheel that allows for flipping action and the ability to drive over obstacles. Three modes include shield,explore and attack. Features: inflatable combo-- best price!!! Creates a pleasant, safe and comfortable world for kids. It's an ideal toy for children to enjoy themselves. Features: Make up set toys have variety of colors and designs. it develops children' imagination and intelligence.